Today marks the 11th annual World Malaria Day and an opportunity to consider the progress made reducing the malaria burden. It is a well acknowledged fact that malaria reduction represents one of the most successful achievements in global health and international development. 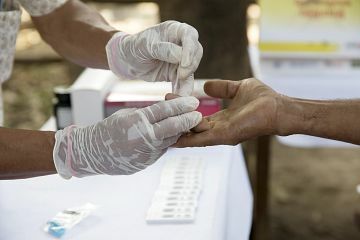 Since 2000, malaria cases have fallen by over 41 percent globally to an estimated 429,000 a year, and malaria mortality rates have fallen by 62 percent, which equates to 6.8 million lives saved. However, the job is only half done. The World Health Organization’s latest World Malaria Report revealed that only 49 out of 91 malaria-endemic countries are on target to achieve 2020 milestones of reducing malaria mortality by 40 percent, and only 40 countries on track to reach the 40 percent reduction in case incidence. Moreover, malaria still places a huge economic burden on many developing countries around the world. Across Africa it is expected to cost $12 billion the economy and inhibit economic growth by approximately 1.3 percent each year. The most common and effective malaria intervention, the long lasting insecticidal net, costs around $2.50 and can protect two people from malaria for up to three years. Other interventions, such as seasonal malaria chemoprevention which can reduce malaria cases in children by up to 75 percent, cost as little as $4.27 per child. Efforts to control and eliminate malaria have also been complicated recently by the spread of drug resistant strains on malaria, which has now been found in Africa and Asia and threatens the progress made in the fight against malaria. This year, the world’s first malaria vaccine will be introduced in several endemic countries. This is the first malaria vaccine to make it to this stage and is a promising new addition to the tools currently available to help control malaria. However, further funding and investment is essential to ensure we continue to provide the most effective, acceptable, and viable tools for scale up if we are to end the hundreds of thousands of deaths and make malaria elimination achievable.